We did a lot of sticking our tongues out today. For the first time this holiday we didn’t have to get up early and so had a liesurely breakfast. The boys sampled the local pancakes, continuing our long-running travel experiment, and declared them good in spite of a strange predilection to put fruit on top of them. Then we set out to sample some local activities. Te Puia is a Maori cultural centre and thermal area. It wasn’t really on our list of things to do, but turned out to be a lot of fun when our first choice fell through. Even though we’d stood on an active volcano yesterday, the bubbling mud pools, deep blue thermal springs and shooting geysers were a lot of fun to explore. We were a bit bemused by the geysers after our Iceland experience with the eponymous original which exploded upwards from nothing on a regular cycle. The local geysers here have a giant explosion of steam and water and then continue to constantly shoot upwards for another hour or so. Quite different and but equally spectacular. Te Puia has a cultural show which is a little bit naff like most of its kind, but better done than many others. 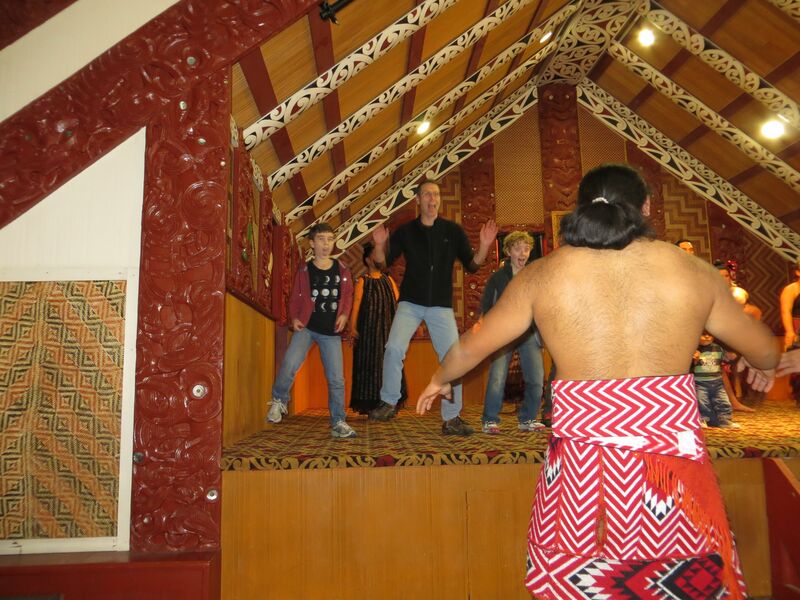 The definite highlight was when Cal, Dec and I got to do the haka with the local warriors. I think the level of fear we induced by bugging our eyes and sticking our tongues out was tempered by our mildly bemused expressions as we tried to follow the quite complex instructions. Te Puia also has a carving and weaving school where they teach traditional skills – which are still very much in demand here. The carvings in particular were absolutely beautiful. Cal got to choose our next activity and opted for one of several local mazes. This was a beautiful hedged labyrinth which was complex enough to present a real challenge in navigation. It turned into a real race which added a certain stress to the whole thing. Onwards again we went for the one thing Declan had been planning for all day. Yet more tongue sticking out. This time with the wonderful local ice-creams. There is something about NZ ice-creams that makes them the best anywhere: Maybe it’s a subtle Maori plot to train the locals in haka skills. And to finish off the day the boys went for a swim in the hotel pool, which is mercifully maintained at a nice 30 degrees, while I sit acting as life-guard and writing this with blue fingers in spite of four layers of clothing. I’m consoling myself with thoughts of a meal at the restaurant that won ‘best lamb’ this year. What a lovely day. When I was a child there was a TV program about a yacht that sailed into mist and came out in another dimension. That sort of happened to us today. We drove South from Auckland through industrial areas and suburban housing. Suddenly we hit a wall of fog; a dense, grey soup. Five minutes later the fog ended as quickly as it began and we emerged into an entirely different place. The Sun was shining down on rolling green fields dotted with white wooly sheep. The blue sky was broken only by the occasional long white clouds that gave the land it’s Maori name. That wasn’t the end of the alternate universe experience. 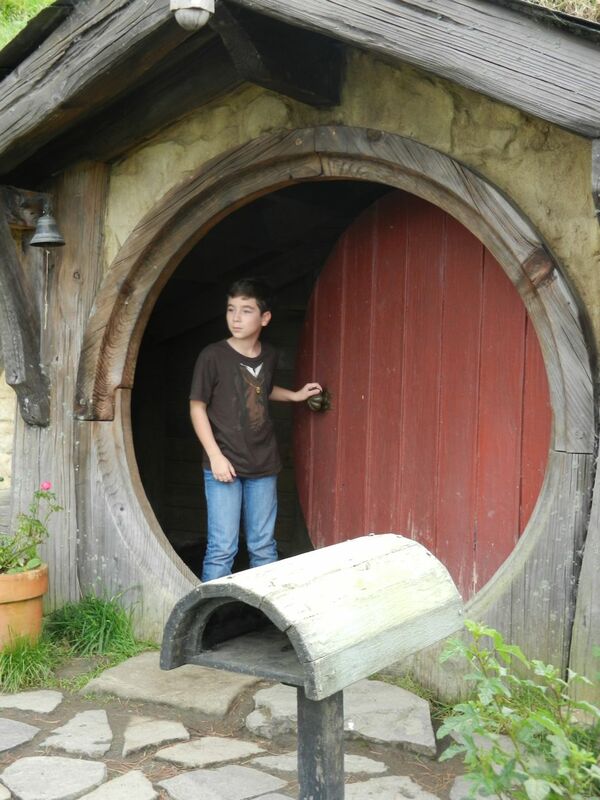 We were headed to Hobbiton – where the Hobbits live. Hobbiton is actually where they filmed the external scenes for the Hobbit village in Lord of the Rings. The spot was chosen both for its beauty and the fact there was no surrounding sign of the modern world. There’s no question that it is an extremely beautiful spot. And the film set is so cute it definitely lends the place a special air. 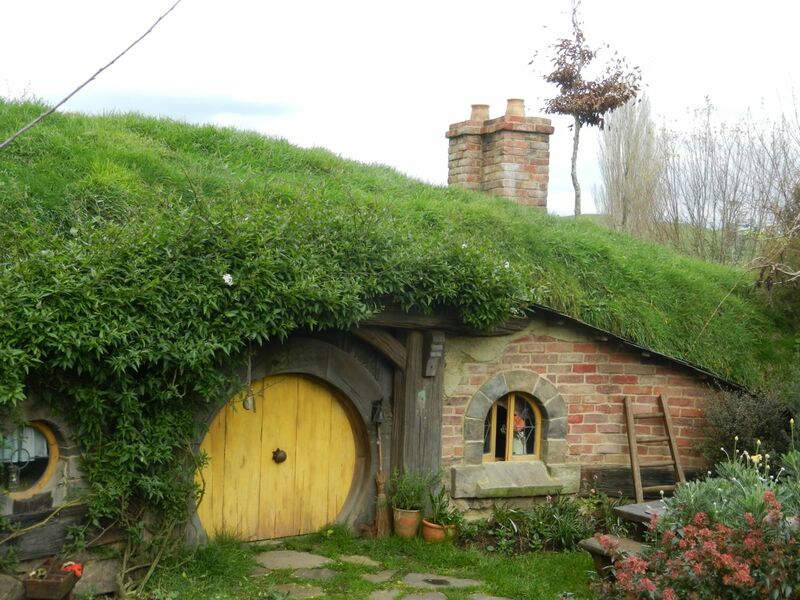 The film set was originally built as a group of temporary structures, but when the film company came back for the filming of the The Hobbit they remade everything as permanent buildings. Well buildings is largely over-stating things, they are permanently made facades. It’s a Potemkin Hobbit village. I struggle with this sort of place. At one level there’s no denying that it’s lovely. On another level it’s entirely artificial. No matter, Declan, as our resident Tolkein expert, had an absolute ball. He ran around everywhere spotting things from the movies. Callum ran around looking for flaws in the building. The point where their interests converged was a story about the tree on top of Bilbo Baggins’ home. Originally the tree was, at a cost of a couple of hundred thousand dollars, dismantled, moved from another site, and re-assembled. Then they came back to film The Hobbit and found the tree had rotted. Now they needed to replace the tree with one that looked the same, only 60 years younger. The solution was to create one from scratch at a cost of $1.7 million. As I said… another world. To cap the day off we ended up in Rotarua. A town where steam rises from the manhole covers. Where mud bubbles in the middle of the park. And, for the record, where they serve ice-cream that even by New Zealand standards is out of this World. During our time in New Zealand we’ve come across a few local inventions and ideas that are worth mentioning. The jet boat is a local invention and a clever one at that. When up to speed they can slide through water as shallow as only 8cm. 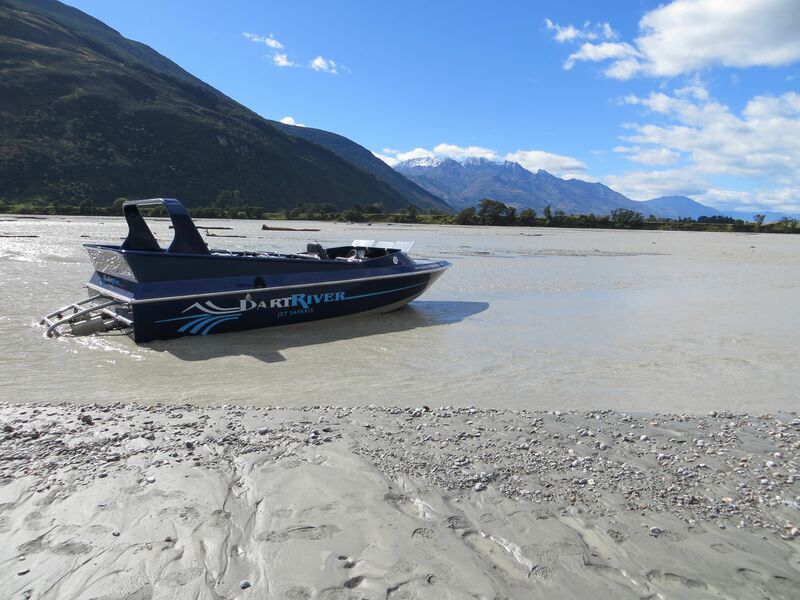 As we found when we got marooned on the Dart River, they can only do that when up to speed; starting them in water even thigh-deep just won’t work. 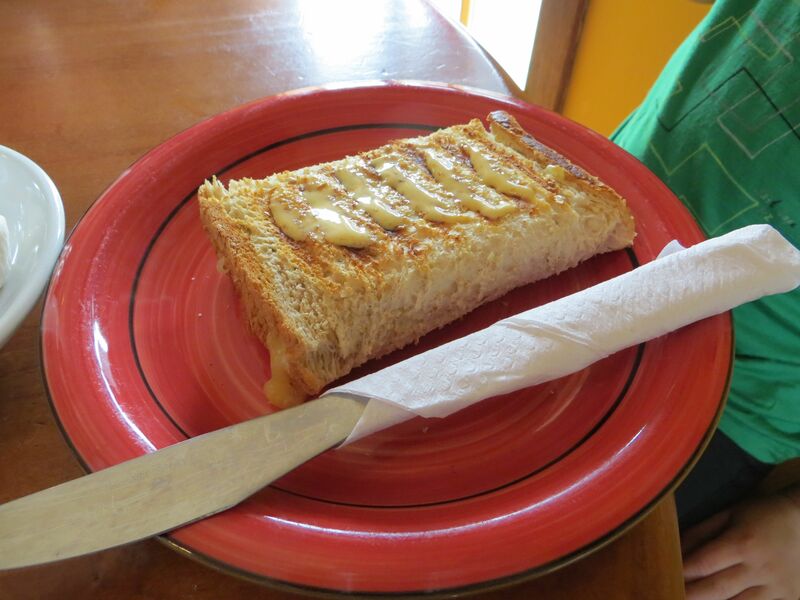 Then there’s the ‘sushi of the south’ – the cheese roll. Neither name really does this culinary innovation justice. Take a piece of white bread, add butter and cheese. Fold into a roll and toast. No more needs to be said. We stopped in at the Hayes Engineering Works while on the Otago Trail. 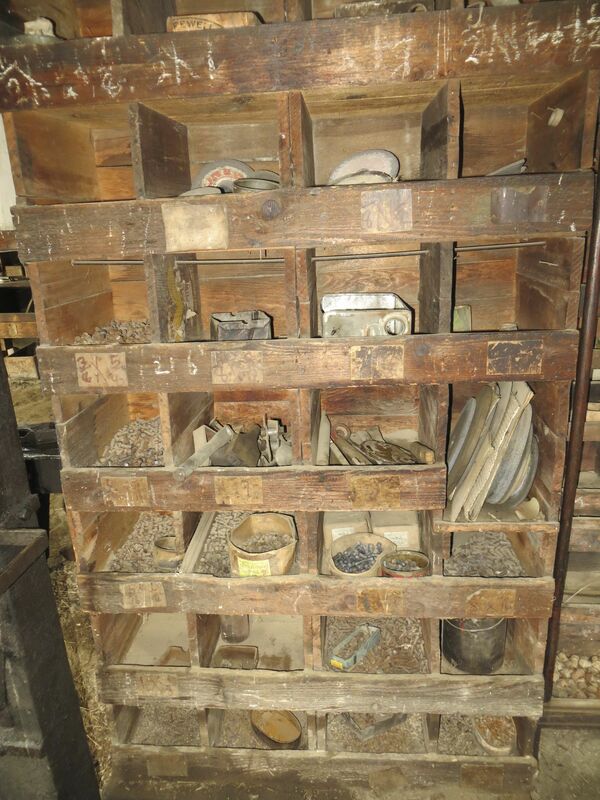 The works are a delight, looking just as if they were abandoned in the 1930s. The Hayes family came up with a series of inventions but they are really known for the World-famous Hayes Wire Strainer. It must be World-famous in circles other than that in which we move, because I’m afraid we hadn’t heard of it before our visit. As we rode up, we tried to work out what a wire strainer was. One of those things you squeeze tea-bags with? A way of trapping large objects in drains? 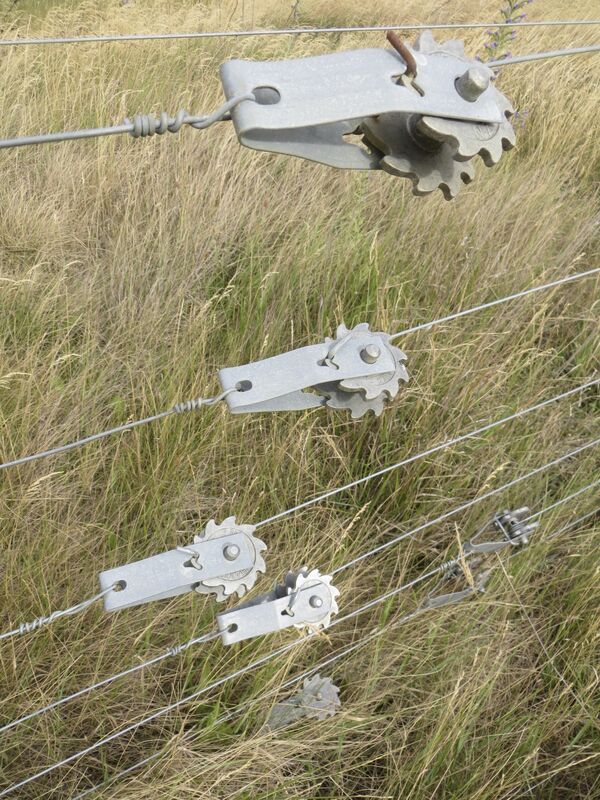 In fact it turns out to be a little ratchet used to keep tension on fence-wires. 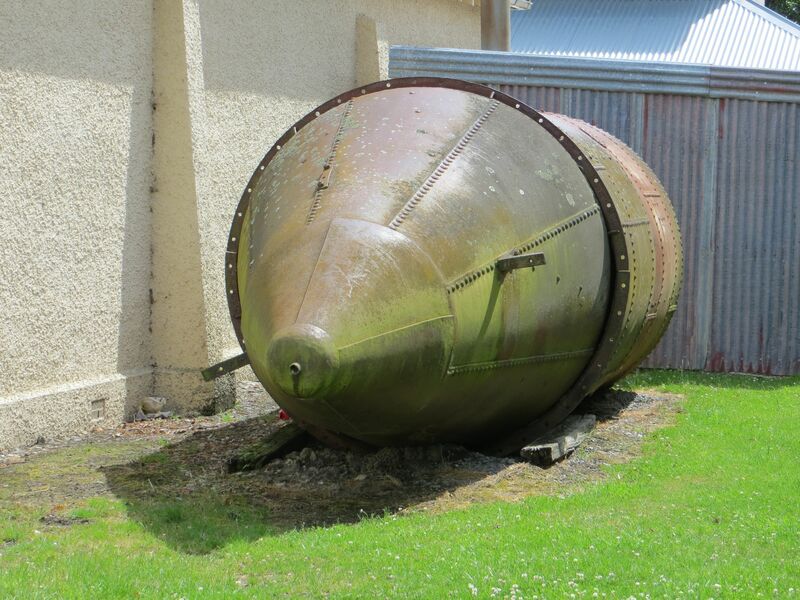 And then there the gold mining submarine we saw in Middlemarch at the end of the Rail Trail. The Platypus was built in the 1870s to work the bottom of rivers and mine for gold. The idea was that a crew of three miners would descend in the boat to the riverbed, there they would open a hatch and get to work with their shovels mining the river-gravel for gold. Sadly the company that owned the Platypus went bankrupt after a single, rather unsuccessful, trial run. The submarine was cut into three parts one of which, in a somewhat ironic reversal, spent the following decades as a water tank. It now sits beside the little museum in Middlemarch, mute testimony to New Zealand innovation (although the idea was an Australian’s). Long straight road and into a headwind. You know what’s worse than riding into a strong headwind that has blown unchecked from the Antarctic? It’s riding into that wind when the last few miles of its journey to reach you have been over herds of sheep. That’s painful riding, bitter cold and the smell of sheep in one annoying package. The section of the Trail from Hyde to the terminus at Middlemarch is probably the least interesting of the whole trail. There’s a great deal of riding along dead straight track through sheep fields. 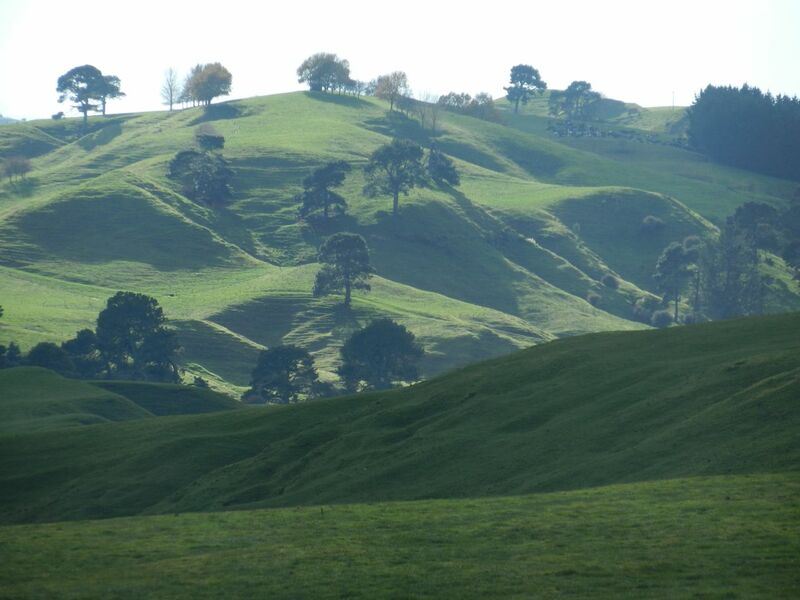 Knowing that some scenes from the Hobbit had been filmed nearby kept us guessing at possible locations. And the site of the Hyde rail disaster, the second worst in NZ history, provided the opportunity for some speculative forensics. Other than that the day just involved clenched teeth and riding, riding, riding. The fact that I had an agonising painful knee added to the misery for me, but it wasn’t a lot of fun for anyone. We were pleased the boys just dealt with it without complaint. In fact after a while Declan seemed to relish pushing into the wind as fast as he could and then waiting for us to catch up with a triumphant smile on his face. 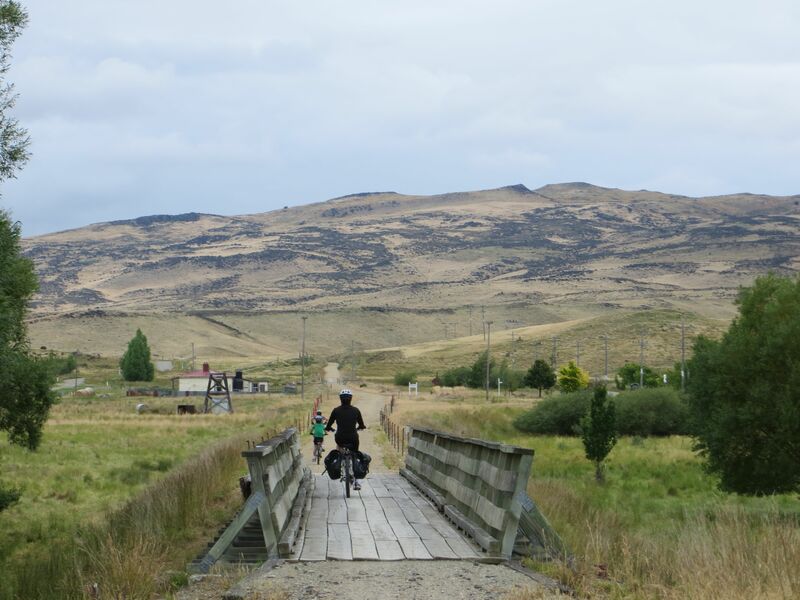 Finally we came to Middlemarch and could, some 160km after first mounting them, hand our bikes back and return to walking. We are it must be admitted walking a little funny though – all those kilometres on bikes and horseback have left their mark. We arranged the whole trip through shebikeshebikes, here’s the review. We emailed back and forth a few times, and they hired the bikes to us, and organised the rest of the itinerary (accommodation, bag transport, curling, etc.). A great way to do it, especially if you don’t want to be part of a group tour. We met a lot of the same people each day on the tour, although we were at the slow end of things (3-4 days is more usual). We could have easily done it in four days, but five was very nice and relaxing, and gave us lots of time in the afternoon for hanging out. 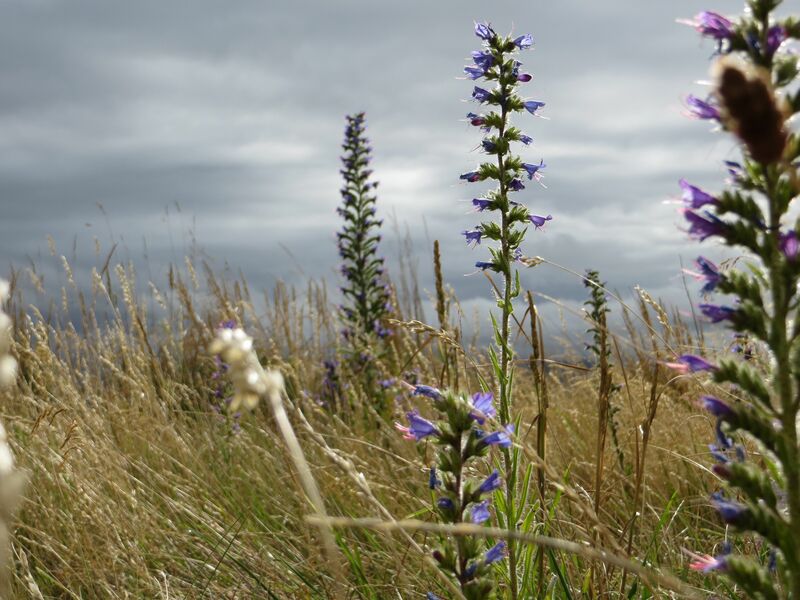 Even at the height of Summer there are beautiful flowers along the Track. The tall yellow plants, that resemble foxglove or tobacco were joined by lovely purple plants today. Bumble bees lazily maneuver amongst the stems and hawks and falcons ride the thermals up above. Even the farmlands were lovely to behold, but the gorges we passed through today were stunning. Deep, craggy rock walls and a wide river rushing along far below. Fir trees hanging on where they could and all against a backdrop of sparse, folded straw-coloured hills and clouds that seem as solid as the land. 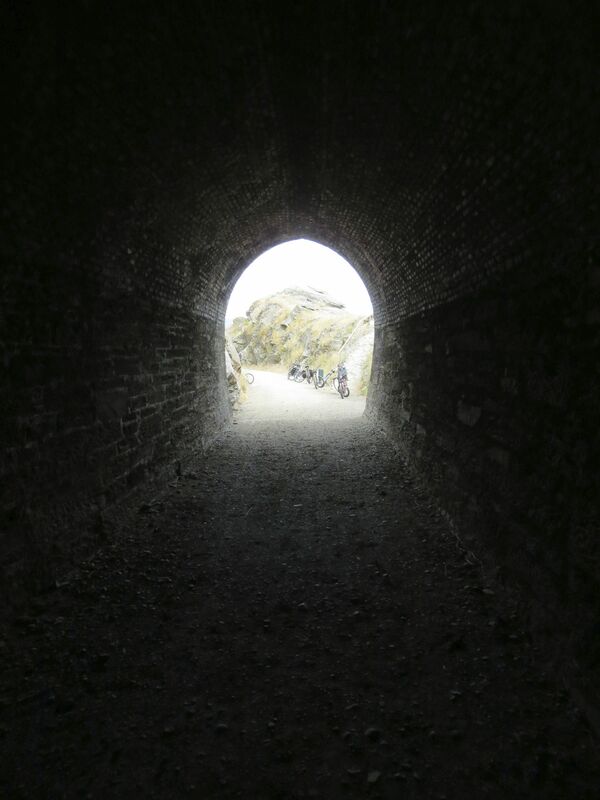 Our path took us through another hand-hewn tunnel and over several trestle bridges. The tunnel was literally cut by hand using little more than picks, shovels and wheel-barrows – and those the workers had to supply themselves. Near the rail tunnel we walked to visit another tunnel that had been cut through 50m of rock to divert the river and create gravel flats that the miners hoped to extract gold from. They failed to find much gold but made an impressive hole which the river rushes into and shoots out of on the other side of the ridge. One way or another much of the land we passed had been impacted by the gold mines. Even the rich-looking farming flats were a lake bed drained by the miners. The lure of gold is a clearly a big incentive. The ride today was not only lovely for the scenery, but also because it was smooth and almost all downhill. The low graded hills over the last few days meant we hadn’t really noticed the hills we’d climbed to gain height, but it all paid off today which saw us on a light downhill slope almost the whole way. This used to be a lake. A bridge to not quite nowhere. It’s very satisfying watching the mile-markers slide past as we make our way down the trail. Today we again did about 35km. The first hour of so was in the rain which was, it must be said, less pleasant. Not only is the rain not so great to ride in but it meant there was no view for anyone and absolutely none for me as my glasses lack windscreen wipers. Still as the world closed in around us it was a good opportunity to contemplate this and that. One thought was that we keep hearing that the biggest danger to the local fauna is the introduced rabbit, possum and stoat. They are of course real dangers, but when you think about it the real danger since white settlement has been from sheep. Riding through the vast, cleared plains covered in white dots, you can only think of how much land was cleared to make way for these woolly intruders. The real difference is only that we humans control the sheep, the rabbits and stoats are on their own. Anyway, the rain eventually cleared and the vistas opened up. The track tend to downhill in this section and we made excellent time, stopping for lunch in the small town of Ranfurly. A lot of the towns along the Track were built because of the railway when the gold mines made this area rich. The gold ran out and then later the railway was replaced by road and the towns suffered a prolonged death. It is largely the creation of the Rail Trail that has brought them slowly back to life as the tourist numbers have built steadily. The towns are quite different now though. There are galleries and cafes, the pubs all serve excellent food and wine – they are growing into small towns with style. We watched a video about the history of rail in the region which wistfully lamented the end of rail and clearly wasn’t enthralled by the creation of the Trail. Steve, our host of the night before last, had explained that the locals had been strongly opposed to the Trail, thinking it a complete waste. One local councillor memorably said the trail would be “a corridor of weeds that will be seen from the moon”. It has taken a few years but there’s no denying the success of the Trail now. 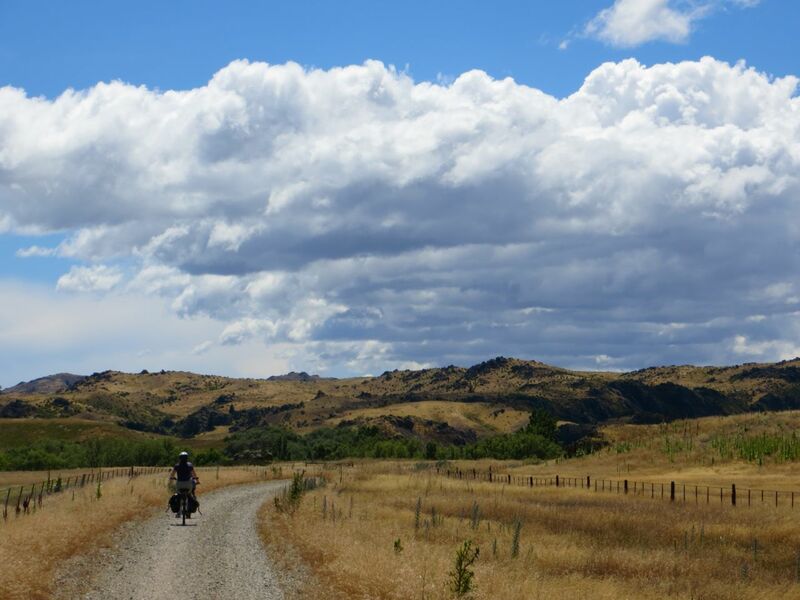 After Ranfurly we headed back out into the wilder countryside for our final stage for the day. A last 10km took us to Waipiata, a village we’ve yet to find out how to pronounce. This is a truly tiny dot on the map; a few houses, a pub and the long-closed-down rabbit processing factory. The factory dates from the days when rabbits were welcomed for their furs and meat and seen as a boon to the country when they weren’t damaging the sheep fields. Unfortunately for the rabbits the bottom fell out of the rabbit market in the 1930s and nothing’s been the same since. Maybe those sheep need to watch out. The Trail today wended its way through some hills. Thanks to it being a rail trail that presented only the most minor problem. Steam trains don’t do steep hills or sharp turns so it’s all gentle corners and when the Trail hits a steep hill it goes right on through. We went over some great viaducts and through two wonderful tunnels. Made by hand, they were a lovely bit of engineering and long enough to be exitingly dark. Even through the Track is lovely and smooth from a hill point of view, it’s still a dirt track and you constantly bump along and slide about a bit. That makes 30km a decent ride. We did it in three and a half hours including rest stops. We probably would have taken longer if we hadn’t had a rather surreal appointment in the afternoon. 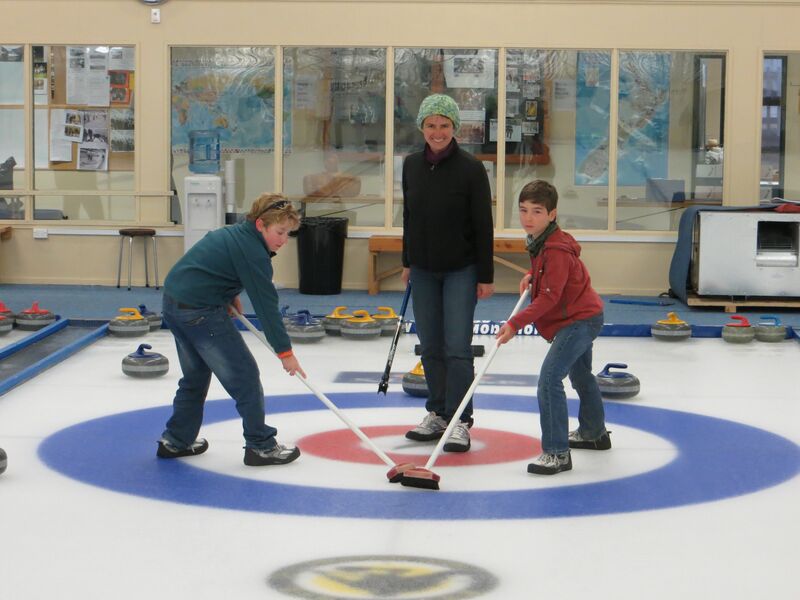 We went curling. Yes, curling. If you haven’t heard of it imagine lawn bowls on ice with a large stone with handle on top instead of a ball. And your teammates using brooms to make your stone go faster. It’s all faintly ludicrous in even normal circumstances. It was great fun to have a go at, partly because of the utter incongruity of going from a warm Summer’s day to a freezing indoor venue to play a quintessential Scottish game in the wilds of New Zealand. It was all rather glorious really. Lovely tunnel on the Otago Rail Trail. 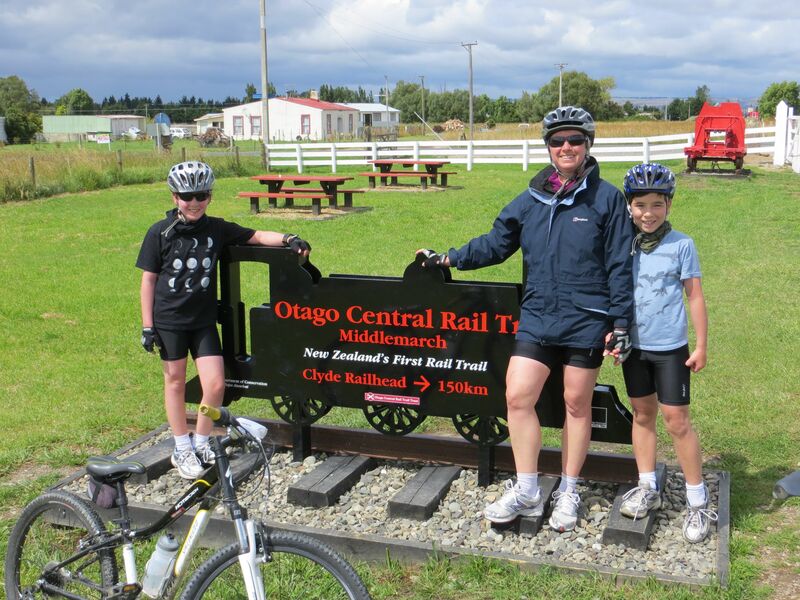 Riding the Otago Rail Trail. The sound of thunder rolling and echoing doing Queenstown’s valley walls woke me at 4am. The accompanying torrential rain just made me shake my head contemplating the awfulness of a day riding in the rain. But it was not to be. By 7:30 we were on a coach heading North. The trip was highlighted by seeing flocks of helicopters hovering above fruit-tree plantations, acting as enormous hair dryers for the trees. And by seeing the Clyde Dam with its overflow throwing out huge jets of water. 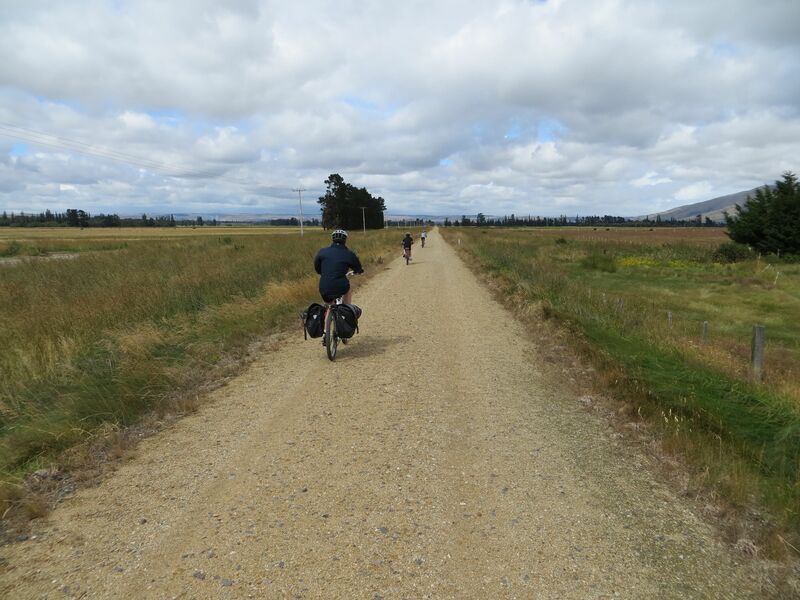 By 10am we had met our bikes and were on the Otago Rail Trail. And wonders of wonders the sun was shining. The ride was absolutely idyllic. The Trail is built on an old railway, so the grade is shallow and there are no cars to compete with. It winds through farms and vineyards against a jagged backdrop of mountains. Because it was a railway, hills don’t stop it – the trail simply, and dramatically cuts through hills in lovely shaded ravines. As the morning progressed it must be said shade became something of a premium. Frustratingly, the land beside the trail is fenced off so the cool, shaded waters of the river we were following were off-limits to us. The idea of riding in the rain was sounding attractive by the time we reached Chato Crossing and stopped at a sleepy pub for lunch and a cooling ale. After lunch we swapped to someone else’s legs and mounted horses. The next 13km, which coincidentally are the steepest on the Trail, were brilliant fun as we rode along them. The boys riding skills came back and then leapt forwards again over the three-hour ride. The ride was great but after three hours we were glad to reach our destination and have a shower and dinner. 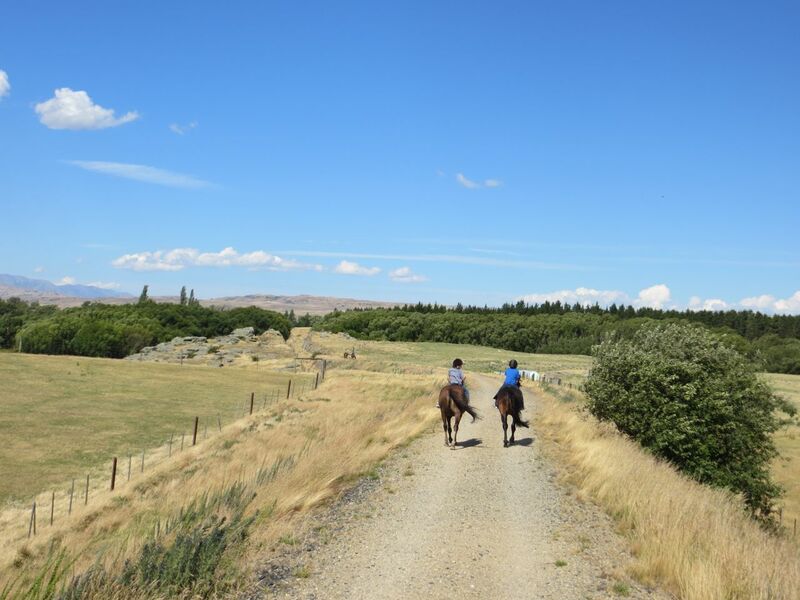 Stunning first day – 26km on our bikes and another 13km on horseback.